Stardate 2002: On , the captain of the starship Enterprise faithfully makes daily entries in the star log. The captain records information about planets the crew has explored, the aliens they’ve battled, and the bizarre phenomena they’ve observed out in deep space, where no man (or woman) has gone before! Now it’s your turn. Just like the captain of the Enterprise, you can record your daily interactions with strange beings in bizarre environments under stressful circumstances, even if the strange beings are all in your own office. The Outlook Journal is your star log. No doubt the high muck-a-mucks of the galaxy use the captain’s log for terribly important things, but your Journal serves you more directly. Sometimes, when you need to find a document or a record of a conversation, you don’t remember what you called the document or where you stored it, but you do remember when you created or received the item. In this case, you can go to the Journal and check the date when you remember dealing with the item and find what you need to know. To get good use from the Journal though, you need to use it. You can set Outlook to make journal entries for nearly everything you do, or you can shut the Journal off entirely and make no entries to it. If you put nothing in the Journal, you get nothing out. What’s the easiest way to make entries in the Journal? Do nothing. The Journal automatically records any document you create, edit, or print in any Office XP application. 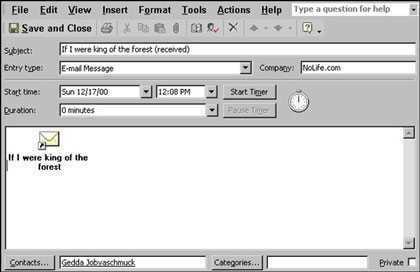 The Journal also automatically tracks e-mail messages, meeting requests and responses, and task requests and responses. 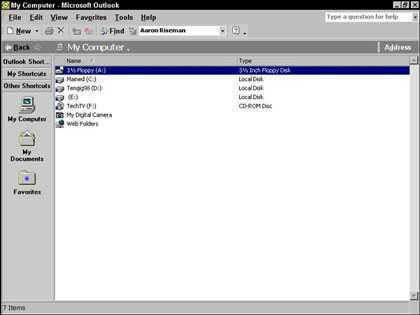 A few programs other than the Microsoft Office applications also have the capability to make entries in the Journal, but that feature is most often used with Office XP programs. There’s a catch: You have to tell Outlook that you want automatic Journal recording turned on. (All right, so you do have to do a little something.) 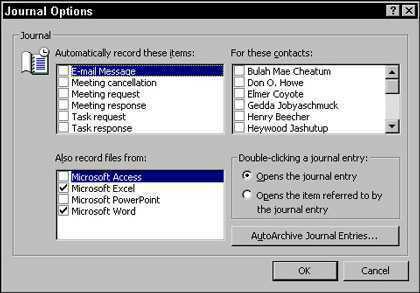 Fortunately, if you haven’t activated the Journal’s automatic recording feature, Outlook 2002 asks you whether you want to turn on the feature every time you click the Journal icon. 2. Click the Journal Options button. The Journal Options dialog box appears, as shown in Figure 1, with check boxes for all the types of activities that you can record automatically and the names of all the people for whom you can automatically record transactions, such as e-mail. Figure 1: The Journal Options dialog box. 3. Click to place a check in the check box for those items and files you want to automatically record and for the contacts about whom you want the information recorded. When you add names to your Contact list in the Contacts module, those names aren’t set for automatic recording in the Journal. You either need to check the name in the Journal Options dialog box or open the Contact record, click the Journal tab, and check Automatically Record Journal Entries for These Contacts. The Journal automatically records those items and files you selected for the contacts you named. If you don’t want to clutter your Journal by recording everything automatically, you can enter selected items manually — just drag them to the Journal icon. For example, you may not want to record every transaction with a prospective client until you’re certain that you’re doing business with that client. You can drag relevant e-mail messages to the Journal and retain a record of serious inquiries. When you actually start doing business with a new client, you can set up automatic recording. 1. Drag the item that you want to record (such as an e-mail message) to the Journal icon. The Journal Entry form appears (see Figure 2). At the bottom of the form is an icon representing the item that you’re recording, along with the item’s name. Figure 2: A Journal entry with a shortcut to an e-mail message attached in the text box. 2. Fill in the information that you want to record. You don’t have to record anything, though. The text box at the bottom of the screen gives you space for making a note to yourself, if you want to use it. The item that you recorded is entered in the Journal. If your favorite program, such as a drawing or desktop-publishing program, doesn’t show up in the list of programs that can make automatic entries in the Journal, all is not lost — you can drag documents from Outlook’s My Computer folder to the Journal folder to create Journal entries for those programs’ files, too. Because the Journal can keep track of many types of information about a document other than date and time (such as client, subject, and some notes), you can use the Journal to keep track of files you create in programs that aren’t part of Microsoft Office. If you elected to let Outlook create Journal entries automatically for your Office XP applications, you don’t have to make entries for Office XP documents. 1. Click the Other Shortcuts separator bar in the Outlook Bar. The icons in the Other Shortcuts group appear, including the My Computer icon. 2. Click the My Computer icon in the Outlook Bar. Your list of drives appears (see Figure 3). Figure 3: A list of drives in My Computer. 3. Find the document that you want to record. Double-click the drive that contains the document you want to record. Then double-click the folder in which you save your documents to find the document that you want to record. Highlight it. 4. Click the Outlook Shortcuts separator bar in the Outlook Bar. The icons in the Outlook Shortcuts group appear, including the Journal icon. 5. Drag the document to the Journal icon. The Journal Entry form appears, with an icon in the text box representing the file that you’re recording. Your document is recorded in the Journal. The big benefit of recording documents in the Journal is the fact that Journal entries are really shortcuts to the documents themselves. When you enter a document in the Journal, you have quick access to information you’ve saved about the document, and you’re only one click away from the document itself. So if you use a non-Office XP program that creates files that don’t keep track of much information about themselves, the Journal is a great central location for keeping track of document information. For example, if you’re saving pictures from a drawing program on your computer, you may want to save more information about each picture than just the file name. If you create Journal entries for each file, you can keep notes about each picture in the Journal. When you find the Journal entry for the picture you want, just double-click the icon for the picture. The program you use to see the picture opens.